It has the basics but needs some additions and to be polished. I hope to get it completed in the near future. What would be the perfect service? Who is in charge of clinical governance? OGRM published an article by Edwin Chandraharan and Sabaratnam Arulkurmaran in July 2007. The RCOG quotes the definition from the Department of Health's paper "A First Class Service" from 1998. I would use this one for the exam, so memorise it. by creating an environment in which excellence in clinical care will flourish". make best use of the available resources. An important concept is that everyone has a responsibility for clinical governance. The most important resource is people. So you need the right mix of the best people. You need to motivate them, ensure their training stays at the highest level and so on. It includes simple things like induction programmes for new staff. But you need to make use of all other resources: buildings, equipment, money etc. Clinical governance applies to the organisation as a whole and to each of its components. The starting point is to determine what the organisation would look like if it were perfect. Then you need to see in what ways your organisation fails to match the perfect model. How do we move from the existing model to perfection? In practice, looking at the whole organisation would be a daunting task. So it is up to each component of the service to look at what it is doing. It doesn't take much to train midwives in using McRoberts' manoeuvre. But the payoff will be considerable in reduced perinatal mortality and morbidity. We can't make everything perfect all at once. So, how do we prioritise the various projects? Who will be in the various project teams? How do we get everyone "on board" and supporting the proposed changes? Patient involvement is pushed by all relevant authorities. It is not for us, the professionals, to decide what is best on our own. In reality, although this is politically correct and an ideal aspiration, it doesn't happen to any great extent. How could we have effective patient involvement that represented all patients? If you were planning services, the patients who were involved might be inclined to push the services in which they were interested. There have always been "Cinderella" services: mental illness, mental handicap, services for the elderly etc. Having patient representatives might improve the services they were familiar with. But it would be an exceptional individual who could be a patient representative and bring the skills and width of knowledge to give a balanced view of strategic planning of all services. You could argue that you then need to have representation from all aspects of the service. This might lead to large and unwieldy numbers. And, being human, inevitable politics with some factions being more powerful, deals being struck etc. Nonetheless, always mention patient involvement in any exam answer. A more easily managed key feature is multi-disciplinary involvement. You might set up the ideal clinical service for managing PPH. You train all your staff and regularly update their training. You audit frequently to ensure your standards are being attained. You use adverse incident reporting to detect problems with implementation or things you hadn't considered. But if the portering service is not up to scratch, there may be delays in getting blood. Then the whole magnificent edifice comes tumbling down. There was a case a few years ago when a pregnant woman had a cardiac arrest in a maternity department. The "crash team" came running along the corridor that linked the maternity to the main hospital with all their high-tech gear. And ground to a halt at the door to maternity as no one knew the code number for the lock. Sod's Law determines that in such a situation no one knows any maternity phone numbers to get someone to let them in. In the real story there was considerable delay, the woman came to harm and the hospital was taken to court and lost. "It is easier if we think of clinical governance as an umbrella term. all of which, when effective, combine to make up good clinical governance. Patient, Public and Carer Involvement � Analysis of patient-professional involvement and interaction, and strategy, planning and delivery of care. Strategic Capacity and Capability � Planning, communication and governance arrangements, and cultural behaviour aspects. Risk Management � Incident reporting, infection control, prevention and control of risk. Staff Management and Performance � Recruitment, workforce planning, appraisals. Education, Training and Continuous Professional Development � Professional re-validation, management development, confidentiality and data protection. Clinical Effectiveness � Clinical audit management, planning and monitoring, learning through research and audit. Information Management � Patient records etc. Communication � Patient and public, external partners, internal, board and organisation-wide. Leadership � Throughout the organisation, including Board, Chair and non-executive directors, chief executive and executive directors, managers and clinicians. Team Working � Within the service, senior managers, clinical and multi-disciplinary teams, and across organisations. The elements are listed in no significant order, and each are of equal value and importance. They are interdependent and mutually reinforcing". 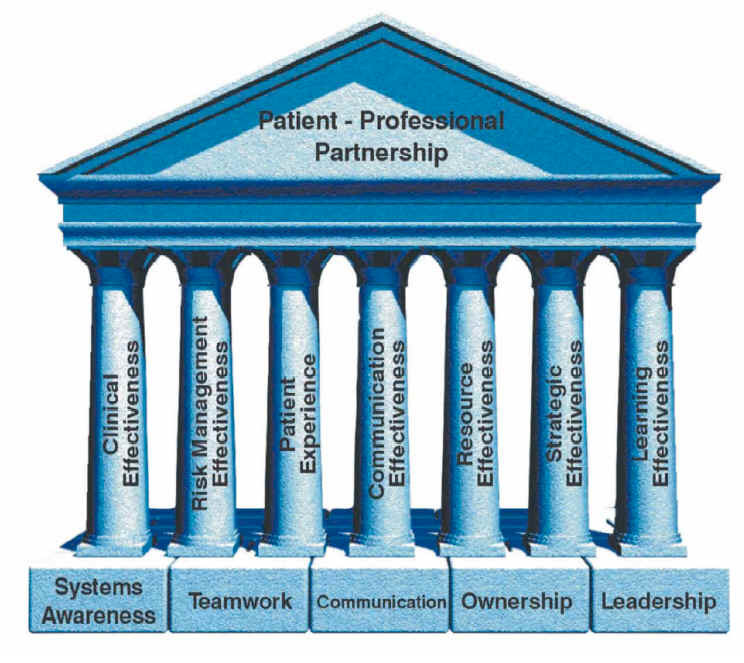 Some of the documents about clinical governance talk of the "seven pillars". The model below is often used, though the idea of the "umbrella" model is tending to replace it. The OGRM article states that the "umbrella" model has replaced it. It derives from the NHS Clinical Governance Support Team,1999 and is used with permission. It is really the same information in a different format, but the pillar and block version seems to make some things more important. For the exam, you have to prepare for a possible OSCE station. It could be an essay, but I think talking about it to an examiner is more likely. I'd make out cards with the key elements. I would use the ones in the NHS Clinical Governance Support Team / OGRM list. This will give you all the buzz words you need and enough to talk your way through an OSCE viva. Reading this sort of stuff glazes the eyes and numbs the brain! The more you read, the more it appears that the topic grows exponentially and into ever-more amorphous forms. Strategic effectiveness: what is Valhalla and how are you going to get there? Getting to Valhalla may be an impossible aspiration. But, if you have a model of what the perfect service would be, you can strive to attain it. Every step you take in its direction improves the service. All talk of clinical governance puts emphasis on patient involvement. The service providers on their own are unlikely to think of everything. And the patients' perspective is bound to put a slant on things. So, "patient experience" is a vital component of any answer you might give. In establishing the perfect service, it would not just be the service itself, but how it would be delivered. who would provide its various components and where and how? Consider something as simple as taking the woman's history. You would almost certainly make out a proforma to make sure nothing was missed. This might be on old-fashioned paper or on a laptop, so as to link directly with a computerised record system. In an ideal world, you might have both. The patient would keep the paper record, so that she could read it, take it on holiday and so on. The computerised record would be useful at the hospital. She could have a copy on a USB memory key, or equivalent. She would be able to plug this into any hospital system in the world. In reality, cost and time would stop you having both paper and computer records. And hospitals are notorious for having computer systems that don't link to each other. So the memory key would not be much use in most other hospitals. Usually you would decide that it should be the midwife who would take the history. But would it be the community midwife or one from the hospital? Would she take the history in the patient's home, the GP's surgery or the hospital? Apart from the logistics, you would find out what patients felt would be best. Maybe it would be giving them a choice of midwife and location. The perfect service will never be obtained. Indeed, what you believe the perfect service to be should evolve. Clinical governance has got to be dynamic and always in pursuit of ever-higher standards. Clinical effectiveness is fairly obvious. You need services that produce the best possible outcomes. This, too, needs patient involvement. You might look at an operation. The perfect service would have zero death rates, zero morbidity, minimal cost, minimum stay in hospital etc. But it would not be perfect if it did not generate 100% patient satisfaction. "Patient involvement is integral in the planning of health service provision. To build on this philosophy the RCOG established its Consumers Forum in early 1993". You need to use audit to confirm that you are hitting your targets. You need to use risk management to identify real and potential problems. You need to use "learning effectiveness" to ensure that your service model is constantly optimised. So, for most topics, all of the seven pillars overlap and contribute. If you want to be politically correct and teacher's pet, you say: "everybody". If you had perfect clinical governance, this would be true. Everybody would chip in their pennyworth to the process of making things better. In practice, the Chief Executive (CE) of the Trust is responsible. I accentuated the word "accountable" in the DOH definition above. This falls on the shoulders of the Chief Executive. The CE is not usually a doctor, so delegates to the Medical Director and Clinical Directors. The Medical Director (MD) will know the nuances of his / her own specialty. So the main job for the CE and MD is to ensure that robust systems are in place and operational. Return to "Viva with an examiner"